I have a fridge full of beer at home, and yet I’ll still find myself out on a Friday night at my favorite bar in town. Why? Bars offer much more than just what’s in your glass: The best are refuges where we find a friendly face, a listening ear, and sometimes a sympathetic pat on the back. I’m not going to go all Cheers on you, but there is something poetic to be said for a familiar watering hole. That relationship, like most, is a two-way street. If you want to get the most out of your beer-drinking experience, it starts with your own attitude and behavior. Having sat at many a barstool in many a city, I’ve noticed that the people who get the most out of their time in a beer bar are those who are polite and willing to ask questions. Trying to flaunt how much you know doesn’t impress the bartender, nor does it help you learn. In the spirit of my advice a few months back to bar-owners (5 beer-menu rules I wish all bars would follow), I now turn the attention to us: the bar-goer. Allow a humble attitude, a thirsty palate, and these five tips guide your way. 2. Do ask for samples of new beers. I’m occasionally guilty of not following this rule myself, and when I do, it always comes back to bite me. I’ll see a beer that sounds intriguing—oooh, a cherry Scotch ale—and commit to the full pint. If I don’t like it after the first sip, I’m stuck with 15 more ounces. When ordering a new beer or a new style for the first time, ask for a tiny taste. Most bars are happy to oblige, because they’d rather you order a beer you like than suffer through one you don’t. It doesn’t make you fussy, it just means you want to like the beer you order. 3. Do send back bad beer. Like the beer-bar version of “If you see something, say something,” don’t be afraid to speak up when you suspect a beer isn’t right. 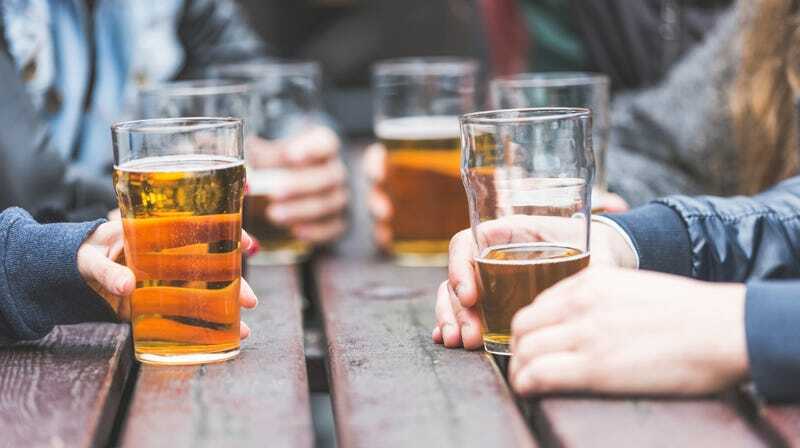 There’s a difference, of course, between a beer you don’t like and a beer that’s gone bad, but if you’re a savvy enough drinker to know the difference, don’t suffer in silence. If the beer tastes like chemicals, or cardboard, or just a really crappy version of itself, politely tell the bartender. It could be a problem on the bar’s end—say they ran an IPA through a draught line that previously served sour beer, but without cleaning it in between—or it could be a problem on the brewery’s end. Either way, a good beer bar will want to know ASAP if something is amiss. I recently sent back a pint of a pale ale I’d enjoyed many times before because I suspected the draught line it was served through was dirty; I got a bottled Sierra Nevada Pale Ale instead. Hopefully, the bar learned its lesson and scrubbed those lines. 4. Don’t get too hung up on beer ratings. Like Yelp, beer ratings should be taken with a grain of salt. I’ve watched other bar customers scan down a menu, typing every beer into Untappd or RateBeer before finally placing an order 15 minutes later. Seriously? Trust your own instincts, people: If a beer sounds like something you might enjoy, ask for a sample. And if you’re torn between a few options, there is a bartender right in front of you who can talk you through your choices. I’m not suggesting there’s no value in beer-rating apps, but don’t let them be your be-all, end-all. With more than 6,000 American breweries in existence, there are plenty of delicious hidden gems that don’t have perfect ratings yet. Trust humans over hype. 5. Don’t be afraid to go to bars solo. I’ve long been an advocate for solo bar drinking (proof: a column I wrote about it way back in 2013). I maintain that a beer by yourself at a good bar is one of the finest of pleasures, and too often we reserve the experience only for cookie-cutter airport bars. If you’re lucky enough to have a great local beer bar, try having a drink there alone sometime. I bet you’ll notice small details you’ve generally been too caught in conversation to pick up on: a weird piece of art, an intriguing bottle on the back bar, maybe a nitro draft line you didn’t know the bar had. Bartenders might offer you some good tips or recommendations—provided you’re not on your phone the entire time. Ask Kate About Beer: What&apos;s the problem with beer flights?